A recent announcement from celebrated scientist and entrepreneur Craig Venter suggests that the plan to create the world’s first mass-market biofuel has stalled in its tracks. In a landmark partnership between Venter and ExxonMobil, Venter and a research team planned to develop a commercially-viable biofuel from algae. Since algae naturally generates oil in higher amounts than biofuel crops, it was believed algae could be the key to developing a sustainable biofuel that would reduce American demand for foreign oil while avoiding stress on food production. But after investing time and money into the research of mass-market biofuels derived from algae, Venter now realizes that nature cannot generate a commercially-scalable biofuel to compete with oil. What solution does he propose instead? Using a fully-synthetic cell as the basis for a competitive algae fuel. Which would make sense, as Venter is well known from his development of the first synthetic bacterial cell back in 2010. Back in 2010, Venter described the synthetic cell as the first cell “to have a computer for a parent.” Now it seems he wants to transfer the knowledge used to make that cell into something useable as a biofuel. To make the synthetic algae cell viable, a team of scientists would have to design an organism that carries out only one task. The drawback to using naturally-derived algae is that algae has to carry out several natural tasks, such as replication. By creating a synthetic cell that focuses on only one task, namely converting sugar to ethanol, that cell would be more efficient, and ultimately more-viable as a biofuel. Unfortunately, the original agreement Venter made with ExxonMobil was for the research of a natural algae biofuel, and ExxonMobil seems reluctant to endorse Venter’s current views. Given ExxonMobil’s history as a fairly conservative enterprise, it is difficult to determine whether they will go ahead with the new synthetic biofuel. If Venter is correct, creating a synthetic cell is the only way to create a commercially-viable biofuel from algae. What are your thoughts on a synthetic biofuel? Is it a viable alternative to “natural” biofuels? Video: Craig Venter speaks about the future of creating biofuels using synthetic biology, and the severe limitations of starting with naturally occurring algae. 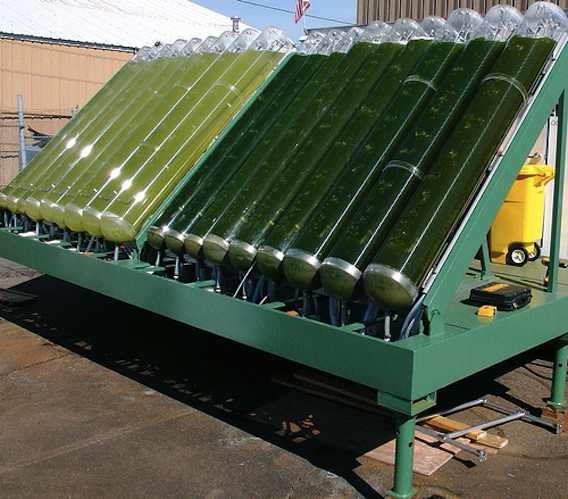 Image CC licensed by Steve Jurvetson: Algae bio-processing system.